I was instructed to go to Hanley, and reached the town on the 31st of December, 1881, accompanied by my wife and one child. The baby was just a year old. It was a Saturday when I arrived. The General had said to me some days before, "Where do you want to go to next?" I answered, "Send me to the nearest place to the bottomless pit." When I got to Stoke station, and began to make my way on the loop-line to Hanley, the pit fires came in sight, and I could smell the sulphur of the iron foundries, and see the smoke from the potteries; I began to wonder if I had not got to the actual place whither I had asked to be sent. At Hanley station we engaged a cab, got our trunks on it, and went off in search of lodgings. For two hours we drove over the town, knocking at many doors. But when we said that we were a contingent of the Salvation Army, the portals were shut against us. At last a poor old Welsh lady took compassion on us and took us in. I went at once to see the battlefield, namely, the building in which the services were to be held. Three young men had been sent to the town to commence operations two or three weeks before our arrival, but they had utterly failed to make any impression on the people. The meetings were held in the old Batty Circus, a cold, draughty, tumble-down sort of place, the most uncomfortable meeting-house in which I had ever worked. The ring of the circus had been left just as it was when the circus people cleared out, and any one who ventured therein was soon up to the knees in sawdust and dirt. There were no seats in this portion of the circus. On this Saturday evening I found two young lieutenants standing inside the ring, making it a sort of pulpit. Sprinkled over the seats of the building, rising tier upon tier were from twenty to thirty people, looking for all the world like jam-pots on a shelf, and singing as I entered, "I need Thee, oh, I need Thee." Believe me, I stood and laughed. I thought it was true enough that they needed somebody. After a brief talk with the people I asked them to meet me in the Market Place at ten o'clock next morning. The two young lieutenants, my wife and myself, Tilly took our stand in the Market Place on Sunday morning. Not a soul came out to support us. I played a little concertina which had been given to me on leaving Devonport by my friends there, many of whom were converts. We sang some hymns, and people living above the shops in the Market Place, thinking we were labourers out of work, threw us pennies. I had no uniform on, in fact, got out of wearing the uniform when I could, and, indeed, never in my life did I wear a red jersey. I used to dress somewhat, although not markedly, in gipsy fashion. Nobody stopped to listen to us. it was rather wet, and the people who passed by on their way to church put their umbrellas in front of their faces so that we should not see them. But we went on as though we had been addressing a crowd. In the afternoon, the four of us were in the open-air again. At night, about eighty people attended our services in the circus. The building seated 2,500 people, but these eighty people huddling themselves close together, to keep warm I suppose (for the building was very cold), sat in the midst of the most appalling and depressing desolation. It was a very dismal beginning, without hope, without cheer, without anything that gave promise of success. But I was resolved to do what I could in this difficult situation. On Monday morning we went to the building to see if we could do something to stop the draughts and get the windows mended. We found a hammer, some nails, and some pieces of timber in the empty stable of the circus, and we worked with these instruments all day, doing our best to make the place habitable. My wife assisted by holding a candle when we had to creep into dark corners in the course of our labours. I sometimes nowadays marvel at the great mechanical skill which we discovered among ourselves. It is wonderful what a man can do, even a man who knows himself to be unskillful, when he is put to it. For two weeks we went on hammering and plastering, and then I secured the help of my brother-in-law, Mr. Evens, a joiner by trade. He spent a few days with us, and in that time we made some seats for the ring. We got hold of some old chairs, knocked the backs off and planked them together. In the meantime we continued our services in the Market Place and our audience grew quickly to large proportions. The people listened attentively, and joined heartily in the singing. But we had never more than a hundred people in the circus. After a month's hard labour I asked the General for help - something in the way of a special attraction. I felt we were not making progress quickly enough. The first month's collections just managed to pay the gas bill. There was no money for the poor evangelists, and no money for the rent. We did not apply for pecuniary assistance, because every station was supposed to be self-supporting, and we had made up our minds that Hanley would pay its way too. The General gave us the services of the "Fry family", a father and three sons, splendid musicians, for a few days. They could sing beautifully and play almost any instrument. It occurred to me that if I could get somebody of local reputation to preside at their first meeting we should have a good congregation. I was advised to call on the Mayor of Burslem, who that year was Alderman Boulton, and ask him to preside. It so happened that the Rev. John Gould, who was then Wesleyan minister at Hull, had just been with the Mayor, and had told him about my work in that great city. On the strength of Mr. Gould's report, Alderman Boulton promised to preside at the first of the Fry meetings. I at once got out a huge poster, announcing that a great public meeting in connection with the Salvation Army was to be held in the Batty Circus, that the Mayor of Burslem would preside, that various speakers would address the gathering, and that the singing would be led by the Fry family. The Alderman was kind enough to invite a good many of his friends, substantial business men, to accompany him to the meeting, so that the platform was filled, and there was a crowded attendance. The Alderman plainly discerned what had been our purpose in organising this meeting, and his speech was indeed a master-stroke. 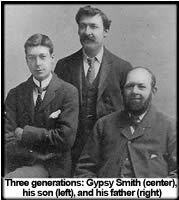 He told the people tersely, though fully, all about my work at Hull, and then he said, "We have not heard Gipsy Smith, and we all want to hear him. I am not going to take up your time. The Gipsy will address the meeting." I was ready and willing, proud indeed to face such a magnificent audience. My sermon was very short, for I desired to get the people back again, and so I sent them away hungry. I never wanted a congregation after that meeting. As long as we occupied this old circus it was crowded at every service. The Mayor had placed the local hall-mark on our work, and we at once entered into the good-will of the whole town. The work in Hanley, once well begun, went on increasing in success and fruitfulness. The revival which had its centre in our meeting-place spread over the whole of North Staffordshire. There was no Non Conformist Church within ten or twenty miles of Hanley that did not feel the throb of it. At the end of every week hundreds and thousands of persons poured into Hanley, the metropolis of the Potteries, to attend our meetings. From 6.30 p.m. on Saturday to 9.30 p.m. on Sunday we had nine services, indoors and out of doors. I conducted them all. We sold ten thousand copies of The War Cry every week. No other station in the Salvation Army has ever managed to do this, as far as I know. I cannot go into any congregation in the Potteries today without seeing people who were converted under my ministry in that great revival. In America and in Australia too I have met converts of those days. I preached every Sunday to crowds of from seven thousand to eight thousand people, and every night in the week we had the place crowded for an evangelistic service. The leaders of the Churches in the Potteries were impressed by the work, and being honest men and grateful for it, they stood by me.